A cutting-edge treatment known as “neurorehabilitation” is helping people achieve long-term recovery from addiction and other co-occurring disorders. Learn what it is and meet one of its practitioners. In the mental health field, the notion that you can improve your brain health in a non-invasive way and without medication is both relatively new and nothing short of revolutionary. Yet that is exactly what “Neuro Rehab,” (which refers to a coterie of “neurorehabilitation services”), is now doing, in treating a wide spectrum of mental health problems. Notwithstanding the neurological benefits, few rehab providers have embraced the groundbreaking neurotechnology, by offering neuro exercises to their patients. In this sense, FHE Health is unique, having developed a whole program of neuro rehab services under the direction of Dr. Nicholas Dogris, Ph.D., BCN, QEEG-D, that are available to every one of our patients. But what exactly is neurological rehab, and how does it work? And, just what sort of conditions can it successfully treat? The million-dollar question: how and why is a rehab that’s grounded in neuroscience so promising for patients with addiction and co-occurring disorders like anxiety and depression? Few are more qualified to answer these questions than our very own Dr. Antonio Rotondo. 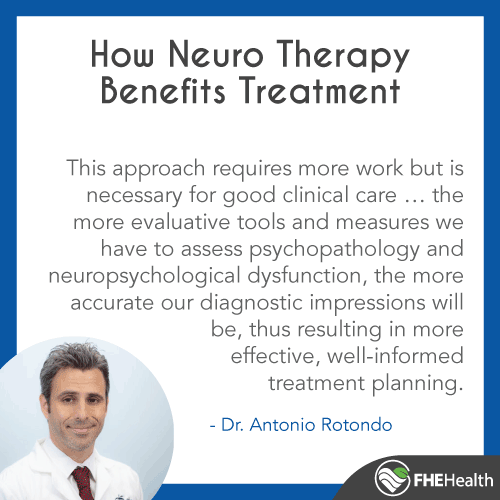 As a clinical psychologist specializing in neuropsychology, Dr. Rotondo helps to administer the neurological evaluations that our patients receive (as one of a number of clinical tools used to assess patients’ treatment needs). The goal: a highly individualized plan of treatment that is based on the results of the evaluation and can be tweaked and modified depending on how patients respond to treatment. A key component to good clinical work is maintaining working hypotheses regarding patient pathology and functioning that continually incorporate new data throughout the evaluation and treatment process. We must also not disregard new patient data or information that does not support our initial impressions, but rather reconcile any contradicting information to reformulate hypotheses. This approach requires more work but is necessary for good clinical care … the more evaluative tools and measures we have to assess psychopathology and neuropsychological dysfunction, the more accurate our diagnostic impressions will be, thus resulting in more effective, well-informed treatment planning … We have several assessment tools that we are implementing methodically and precisely. Then, with the results that our assessments glean, we formulate treatment protocols that are unique, individualized and based on the patients’ subjective complaints in conjunction with the quantitative data the analyses provide. Dr. Rotondo said that the first step for anyone admitted into a detox or mental health track at FHE Health is to receive a “qEEG.” This non-invasive test involves wearing a cap with electrodes on it that reveals the brain’s electrical energy patterns. The resulting “brain map” helps to facilitate a digitized assessment of overall brain health. “From that assessment, we’re able to see if there are areas of the brain that are dysregulated or not functioning as they should be,” Dr. Rotondo explained. For example, when the presenting issue is substance abuse or a mood disorder, there may be poor communication in a region of the brain known as the posterior cingulate. Or, the prefrontal cortex may be dysregulated. The qEEG helps to identify these issues. “Based on that qEEG, we’ll create a treatment plan which may involve neurofeedback and transcranial stimulation treatment,” Dr. Rotondo said. With brain stimulation therapy, it is not uncommon for a clinical therapist to be present as the neuro stimulation is taking place— when “the brain is at more of a plastic state,” as Dr. Rotondo described it. What he has found is that patients who may be having trouble processing key issues with their therapist are better able to process these issues when they simultaneously are undergoing brain stimulation therapy. He gave the example of a client in our First Responder program who had PTSD and was suicidal— but who could not access or process these issues and their related emotions. Thanks to brain stimulation therapy, the patient was able to emotionally access and process these issues with the help of his therapist. Dr. Rotondo said that patients are also better at learning relapse prevention and psychoeducation, when Neurostim is paired with a therapist. The other advantages of neuro therapy are that it’s “non-pharmacological and non-invasive and can have immediate effects” (unlike medications that can often take weeks to kick in). In fact, Dr. Rotondo has seen many patients experience “almost immediate remission of symptoms.” He noted that these treatments are not just beneficial for people with substance use disorders or other mental health diagnoses. Citing athletes and business executives who want to improve their cognitive and motor functioning, he said that many people without any underlying mental health condition can benefit greatly from neuro therapy. 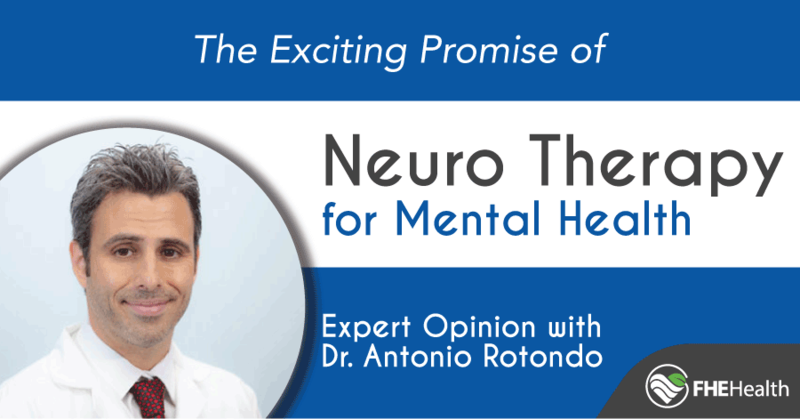 Given the promising outcomes he sees in patients who undergo neuro therapy, Dr. Rotondo speculates that neuro rehab may one day even replace medication as the first line of treatment for many disorders.